Remember that old song of Bob Dylan’s about Hurricane Carter? It contains the lines – ‘the authorities … put him in a prison cell the one time he could a-been The Champion of the world.’ They have intermittently resonated around my head for over 40 years. The words came back as I walked down to St Paul’s Cathedral after the second day of the excellent First International Forum on Online Courts organised by the Society of Computers and Law (SCL) and Her Majesty’s Courts and Tribunals Service (HMCTS). And the link made by my subconscious while I was searching for a theme for the conference? Well, it might seem a little fanciful but it works for me. The HMCTS and SCL had assembled a world class array of contributors and delegates. As reported yesterday, my count was 17 presentations from different jurisdictions. Richard Susskind asserted today that 26 were present in total as the conference programme moved on today from country reports to themes. High level contributors, who stayed for much of the day, included Lord Briggs whose reports had started off the online drive and Sir Ernest Ryder, Senior President of Tribunals, who wrapped up the conference. Over both days, there was enough material to inspire the English and Welsh courts to be champions of their world. The conference heard the lessons of best practice. Presentations like that of Oxford’s Dr Sandra Wachtel were excellent. She gave a strong account both of how artificial intelligence worked generally and how it had been used, largely in US courts, and what she saw as the approach to adopt. Incorporating AI within court processes would be helpful but not easy. Inferences from predictions must be shown to be reasonable by reference to statistics, fairness, explanation and the needs of transparency. She summarised the leading US cases. These include not only the well publicised and problematic Loomis v Wisconsin (about the proprietary COMPAS assessments of risk) but also Houston Federation of Teachers v Houston Independent School District and the challenge to AI decision-making in relation to the Medicaid Programme in Idaho. The imminent transfer of the social security tribunal online means that Ms Sheppard’s time should have come. She certainly knows how to set up and run an online tribunal. And she is very clear about certain aspects. For example, she polices the local authorities who issue parking notices. Her online appeal portal automatically logs cases on dashboards that light up among her councils the length and breadth of the land. Appeals are made; evidence is submitted; hearings are held and organised online. She has 12 staff in addition to adjudicators and they are freed by technology to guide appellants through the process – in the course of which they disclose their own identities and chivvy the case to a conclusion. The point is that she has transformed the operation of what is admitted a pretty obscure – though no doubt invaluable – part of the judicial infrastructure. Any social security tribunal that wants to be seen as the champion of the world would need to take on board her lessons. It is not quite clear, however, that this will be the case. The plans are, as outlined to the conference by President of the Social Entitlement Chamber of the First Tier Tribunals Judge John Aitken, for some interesting initiatives. There will, for example, be an online continuous process of judgement designed to dispose of cases more quickly. And there is the rub. Those attending the conference heard best practice in relation to dealing with tribunal cases. However, online decision-making looks likely to be seized on as a way to deal with what is seen as worryingly upward trends in cases and staffing. 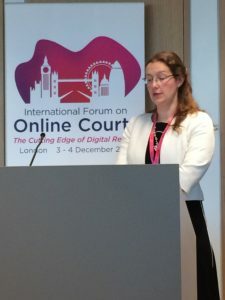 We know that assistance for claimants has been off-shored to other organisations outside the courts service and limited to issues relating to digital capacity. No in-house team of the kind fostered by Ms Sheppard: HMCTS has to hit its staff reduction targets. All this takes place against the backdrop of the national introduction expected soon of the highly controversial benefit Universal Credit. No account will be taken of the potential of online processes to open up dashboards for the Department of Work on Pensions on appeals being made against it. And, thus, an opportunity is being missed to transform the social security tribunal jurisdiction into an effective way of policing the practices of a department widely criticised for low standards. So. That is the argument that the tribunal reform is being imprisoned just at the time when it could become the best in the world by politically imposed targets for staff cuts and spending reductions. Now, if you were inclined to something akin to benign conspiracy theory, you might argue that HMCTS hopes to use the conference to influence its judicial and departmental sponsors towards genuine world-leading status and to ease its prison shackles. Or it might be oblivious to the irony of the contrast between the content of its conference and its own plans. You take your choice. But, hey, the authorities never cut Hurricane Carter any slack and he lost his chance at the world title.